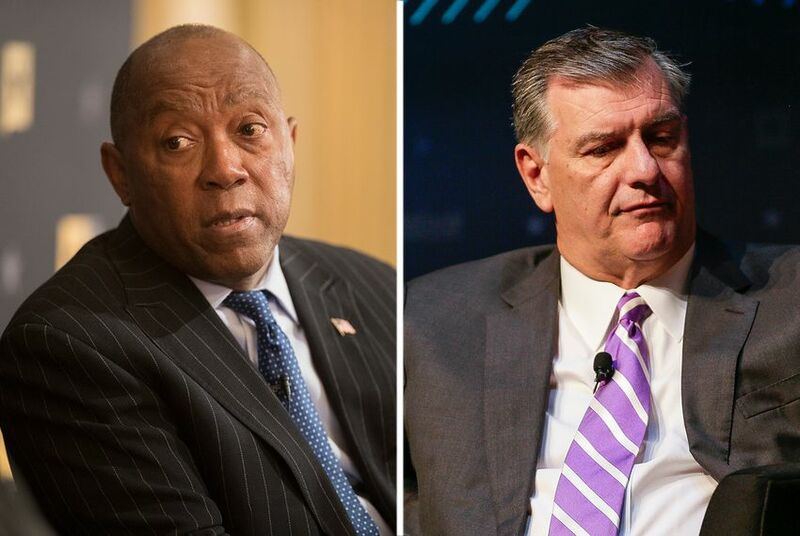 Pension leaders and elected officials in Dallas and Houston had one job: Get all parties from each city on the same page about how to shore up multibillion-dollar retirement fund shortfalls before seeking help from state lawmakers. The Houston fire pension fund opposes both the House and Senate bills that aim to shore up that city’s shortfalls. The vast majority of unfunded pension liabilities in Houston come not from the firefighters' pension but from the municipal employee retirement fund and police pension system, according to credit rating agency Standard & Poor’s. The municipal and police systems respectively have 48 percent and 62 percent of the money they are expected to pay out to retirees over coming decades according to S&P. The firefighter fund, meanwhile, has about 81 percent of the money it needs to cover future pension costs. That puts it among the best-funded pension funds in the state. The Houston shortfalls in the police and municipal funds partially stems from years in which those respective boards agreed to let the city underfund its own contributions to the pensions. The firefighters didn't strike such a deal. To repay the underfunded amounts, the city plans to issue $1 billion in pension obligation bonds and give $750 million to the police pension and $250 million to the municipal system. City Hall and both of those pension funds are on board with the plan, though the Senate passed a potentially problematic bill in March that could require voters to approve issuing the bonds. Scores of Houston business leaders have been lobbying lawmakers to include that election requirement to the Legislature’s pension fix, but it's a provision Turner adamantly opposes. Bill King, who opposed Turner in the 2015 Houston mayoral race, is among that group of Houston leaders at odds with Turner on this issue. They also want any pension fix to require that future employees be given defined contribution plans akin to 401(k)s instead of defined benefit plans like pensions. In Dallas, police and fire employees share a single pension fund, which credit rating agency Moody’s recently said has the second-worst pension funding ratio in the country relative to the city’s revenues. S&P estimates that the fund has 28 percent of what it will need to pay retirees. That's the case even though, unlike Houston, Dallas continuously paid its required contribution into the retirement fund. What’s driven the financial crisis there is instead a mix of poor investments, generous contributions and the fact that pension members withdrew more than $500 million from accounts last year amid fears that the fund was about to collapse. Police and firefighters support State Rep. Dan Flynn's House Bill 3158 which seeks to shore up the system’s massive shortfall. But many City Council members oppose the bill because it regularly escalates the city’s contribution to the fund and doesn’t swing the balance of power on the board to give city appointees a majority of seats, an arrangement city officials have argued is needed for the city to avoid financial shortfalls like this in the future. Meanwhile, some Dallas leaders have spurred an entirely separate debate about how to fill the pension shortfall. The city's pension board last week passed a resolution that said Dallas should divert part of the sales tax it spends on public transit to the troubled retirement system instead. Other council members, including Mayor Mike Rawlings, oppose such a move in how the city spends its sales taxes. And DART officials have questioned whether it's possible without a separate change to the state law that governs the public transit agency and its members. Still, DART is taking the idea seriously because it could cost the agency $35 million a year.